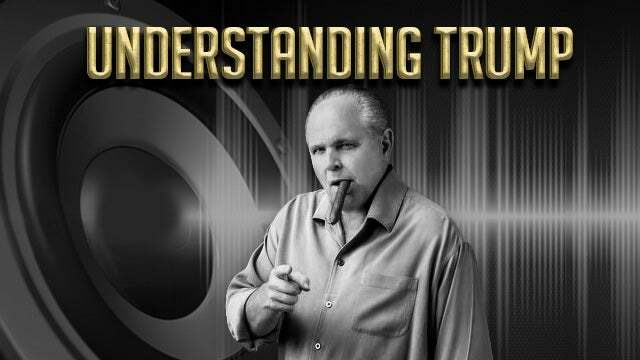 RUSH: As I mentioned, President Trump has doubled down on his criticism of McCain. Let me set this up for those of you who… Well, you may think you know the whole story. Donald Trump’s problem with John McCain predates his comment during the presidential campaign of not respecting military people who get captured. But he made that comment during the presidential campaign, and… This, again, is something that I don’t… The thin-skinned reaction to that by McCain shocked me. I would think as a United States senator, somebody with his educational background and military background, a thick skin would just naturally have developed. But, you know, I think one thing that we’re learning is that these exalted members of the D.C. ruling class who think of themselves as elite and special? I think they have some of the thinnest skin in this country. I think they think they are above any criticism from outside. If you look at Bush… The Bushes are part of the D.C. ruling class, but look how they were treated. George W. Bush and Karl Rove were routinely destroyed by the D.C. media, the Washington ruling class. But since it was the ruling class that did it, the Bushes understood it, and they knew that it was not personal. They knew it was political and that once Bush left office, he’d be back to his exalted position as an ex-president. But the criticism from outside the ruling class? These people can’t take it. I was stunned at the McCain funeral. I was stunned that at the funeral for John McCain the overriding objective was to be critical of, and respond to and answer, Donald Trump! At a funeral, where you’re supposed to be focusing on the salvation of the soul of the deceased, instead it became an attack marathon on Donald Trump! What kind of thin skin is this? People we elect as leaders are supposed to not have this kind of thin skin. They’re supposed to be above all of this. They’re supposed to be confident and secure in who they are, that these little things are no more than gnats yapping at the ankles. But this criticism of McCain that Trump offered must have really — must have really — gotten to him, because after that, all McCain needed to hear about was this dossier, and he took the lead on getting a copy of it. Look, it was more than the comment about not respecting military people that get captured. McCain really believes, ’cause there was a press conference or some… Maybe it was on the floor of the Senate. I forget where it was. But McCain was dumbfounded over Trump’s agenda of nationalism and making NATO members pay their fair share, pay their dues, redoing trade deals so that other nations would have to deal with us more fairly, stop taking advantage of us and picking our back pockets. 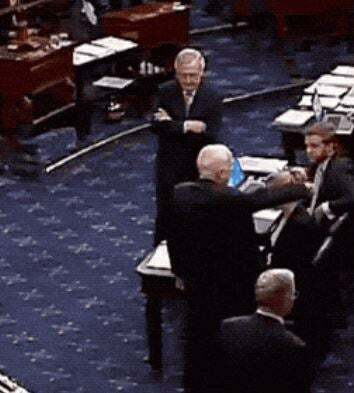 McCain was righteously offended by this, and he’s out there saying, “Why in the world would we want to come along and destroy the post-World War II order that we built?” Well, that was an admission of what the ruling class did and their globalist intentions for the country. Post-World War II is where the Cold War was created by divvying up parts of Europe to the Soviet Union and to not the Soviet Union, to create the Cold War and create this permanent confrontation. So we create NATO, the Marshall Plan to rebuild Europe and all that. We set ourselves up as the leaders of the globalist movement, and that’s what the world order that McCain was talking about was. This is what the ruling class of Washington signed onto And of course, once you sign onto a globalist agenda, then the United States as a separate entity or nation is gonna play second fiddle, because the globalist intention is larger than any one nation in it. And this was what Trump was railing against. He didn’t understand this, he didn’t approve of it, he didn’t like it. What happened to America being the leader of the world, not some consortium of people that can’t lead anything without us? Why do we give them a chance to pick our pockets in trade deals? Why do they demand that we defend them so they don’t have to pay for a military? Why is all of this on us? And at the same time it’s on us, all these other nations are running around ripping us to shreds criticizing us — and Trump said, “None of this makes any sense. “This is stupid! You wouldn’t run a business this way. Why would we run a country this way?” McCain was righteously indignant over Trump’s attack on this globalist order with the United Nations and diplomacy and the State Department at the top of the pecking order. Then Trump comes along and makes his comment about McCain not being respected because he got captured, and that’s all it took. McCain never got over it, and he became one of the spearhead leaders of this dossier — which is phony, fake, fraudulent. Not a word of it is true. None of it’s ever been verified. You know the deal on that. Trump never backed down, and McCain never got over it, to the point that his funeral was not totally but largely devoted to criticism of Trump from the various people that spoke eulogies and so forth. So Trump has been recently criticizing McCain, again, once it has been now been widely reported McCain’s role in the dossier procurement and its promotion. Anybody involved with the dossier was singularly purposed toward getting rid of Trump. THE PRESIDENT: I’m very unhappy that he didn’t repeal and replace Obamacare. As you know, he campaigned on repealing and replacing Obamacare for years and then he got to a vote and he said thumbs down. And our country would have saved a trillion dollars and we would have great health care. So he campaigned. He told us hours before that he was going to repeal and replace, and then for some reason — I think I understand the reason — he ended up going thumbs up. And frankly, had we even known that, I think we would have gotten the vote ’cause we could have gotten somebody else. So I think that’s disgraceful. Plus, there were other things. I was never a fan of John McCain, and I never will be. RUSH: So classic Trump. I don’t care what you think of it, he’s not backing down. He is doubling down — in this case, tripling down — on McCain. I’m just telling you, this goes back farther than Trump’s comments about not respecting people that get captured. By the way, think back to that. What was your reaction when you head it? Now, McCain… Let’s be honest: McCain had lost a lot of popularity within the Republican Party. He had been perceived as a RINO and a faux conservative when he needed to be, like during the campaign, but he actually wasn’t, more like a ruling class deep state leader and denizen. So here comes Trump, “I don’t respect military people that get captured. Why should I?” What was your reaction? When you first heard that, did you think, “Well, that’s it for Trump. You can’t say stuff like that, especially John McCain, Hanoi Hilton. I mean, what he went through over there, what he put up with, refusing early release ’cause they wouldn’t let his fellow prisoners out. And here comes a guy, ‘I don’t respect a guy that got captured.’” What was your reaction? You were in total shock. And were you thinking that might be the end of Trump? I mean, the American people, we value our heroes, we invest a lot in our heroes. (interruption) You thought he would walk it back? Well, you know, it’s 20/20 hindsight. But I’m gonna tell you, just like with the Access Hollywood video, I did not think it was gonna hurt Trump. I didn’t think it was maybe helpful, but I didn’t think it was going to hurt him. I did not think it was going to make people that wanted to vote for him change their mind, just like the Access Hollywood video didn’t. Because I have understood from the moment Trump got off that escalator on June 15th why he clicks with his base. I may understand it better than even Trump does. No offense, but I understand it. And I understood why none of the traditional ways that the media and Democrats have gotten rid of Republicans were ever going to work when deployed against Donald Trump. They just weren’t. RUSH: Trump in 1999, when McCain was running in the Republican primaries against George W. Bush, Trump was toying with the idea back then, and Dan Rather interviewed him. Dan Rather asked Trump about McCain. Trump was toying with the idea of running in the Reform Party. He quit the Reform Party when he found out David Duke was a member. But back in 1999, Trump told Dan Rather McCain was captured. “Does being captured make you a hero? I don’t know. I’m not sure.” So this goes way, way back beyond the 2016 presidential campaign.